The mission of C2 Technologies* is “to be the best performance improvement company,” and there is no doubt that C2 is serious about accomplishing this mission, especially with Dolly Oberoi at the helm. After meeting C2’s CEO, I can very easily understand why C2 is one of the Metro-DC area’s fastest growing companies. *Note: C2 Technologies is pronounced “C-squared Technologies” – not “C-Two Technologies”. Dolly Oberoi explains the early days of C2 – and her beginnings as an entrepreneur – far better than I could convey, in the following videos. In 2014, Dolly was honored by the Washington Business Journal’s annual Minority Business Leader Awards program. C2 Technologies headquarters is on the 10th floor (the entire top floor) of this office building. From its humble beginnings in 1989, C2 is now a company with over 400 employees at 22 global locations. It has three central offices in the United States and has won over 150 awards. A few of the 150+ awards C2 Technologies has been awarded over the years. 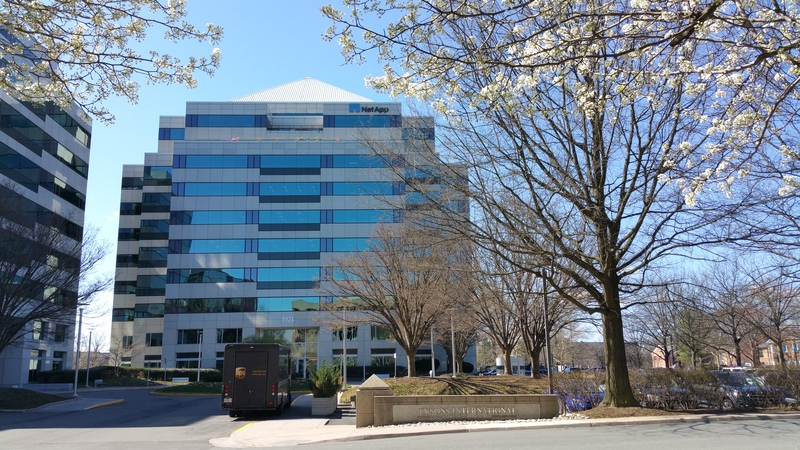 When I visited their headquarters in Vienna, Virginia, to meet with Dolly Oberoi, I was warmly welcomed by a very hospitable receptionist named Lauren. Dara Nicholls, C2’s Vice President of Federal Training Solutions, then gave me a tour of their office. Dara walked me around the halls, showing me posters and using them to tell me about their past work (click here to see their portfolio). Dara was intimately familiar with each of the projects and took pride in showing me their beautiful office. How would you like to step out on the balcony to this view every day? The office facilities included several conference rooms, a collaborative ideation lab, offices, cubicles, a large printing and “water cooler” area, and a host of dedicated, busy professionals quietly and conscientiously going about their work. The view from their largest conference room was anything but shabby. The largest conference room at C2 Technologies’ headquarters. 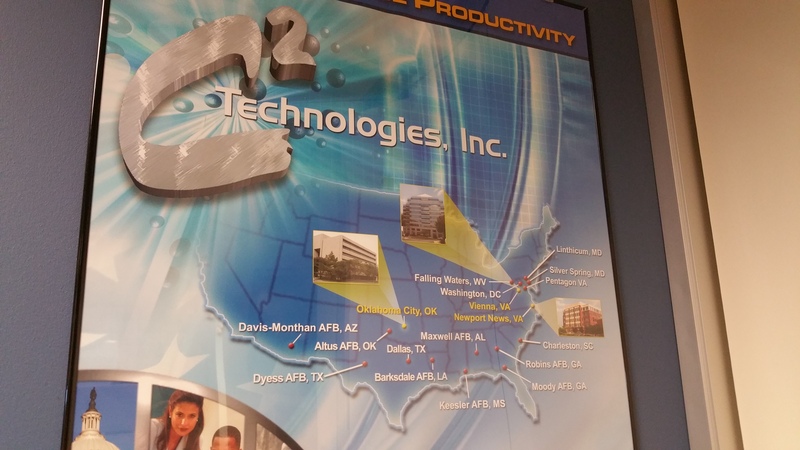 A poster outside the conference room pictured above illustrated C2 Technologies’ office locations. You could see the portfolio posters neatly arranged near the offices of the people who had done the work for those projects. I felt it was a creative way to showcase work to prospective clients and also a way to engender pride in the company and what its people were doing to make the company great as a whole. Poster indicating work C2 Technologies had done for Microsoft, on a product near and dear to my heart. One of the projects we discussed, both Dara and Dolly spoke about it, was the work C2 had done for Microsoft. This project was actually used as an example of best practices in this book (starting on page 49), published by ASTD (now ATD). C2 seems to be experts at providing training solutions for aircraft and the pilots and aircrews that fly them. They provide solutions “for every aircraft in the kill chain.” In some of the projects they will partner with companies like L3, where L3 would develop and implement the multimillion dollar simulators and facilities for these aircraft, and C2 would make sure that everyone knew how to actually use the equipment. I found this particularly interesting because of my work with the Coast Guard while employed with Harkcon doing very similar things. I am currently taking courses to earn the first offering of the Executive Chief Learning Officer (ECLO) graduate certificate offered by George Mason University. After I had written this post interviewing Jeffrey Katzman, the CEO of Core Learning Exchange, and published it on LinkedIn, Dolly Oberoi wrote me a message. Thanks for writing about the ECLO certificate course since it’s my brainchild and I partnered with GMU to get it started. Keep writing and promoting it since we are also the sponsor of the program. Flyers in the lobby indicating C2 Technologies’ support for the ECLO program. Note the TIE Award mentioned above and that C2 was listed as one of the best places to work by okcBiz. After my tour, I came to meet Dolly Oberoi face-to-face, where she shook my hand. We moved to a smaller conference room (albeit with views just as majestic as described above). And that’s where we began our interview. Much like my previous interview with Jeff, the following is based on my memory and notes taken during the interview. I’ve paraphrased and edited as necessary to convey the general flow of the conversation. EJ: So, how did you begin working with George Mason University to give birth to the ECLO program? Dolly: I happened to run into Dr. Nada Dabbagh at an airport in San Francisco. We started talking, I mentioned how there was a gap between helping people become learning professionals and helping learning professionals become leaders – especially executive leaders. Nada agreed and set some meetings up between us at C2, the GMU College of Business, and the GMU College of Education and Human Development. Some time and meetings later, here we are. EJ: That in addition to all you do here? That’s amazing. Dolly: When you’re a leader in the learning, development, and performance improvement community, you work non-stop, pouring your life into it. Sure, it could be exhausting, but it’s a labor of love. When you do what you love, it’s not a job, right? It’s your life and the mark you leave on the world. We discussed the learning profession on a general level – including some instances of C2’s past performance. When she mentions that some of the interventions were designed with a constructivist approach, I asked her the following. EJ: Are there any learning models, authors, or theories that you as a company ascribe to? Any favorite authors you consider as go-to experts in the field? Dolly: At the end of the day, you have to develop your own brand, your own way of doing things. So we read everything we can and use what makes the most sense for that client at that moment. You can follow anyone’s model, but at the end of the day you have to have a personal brand. When you make your own path, that’s part of what being a leader is. EJ: You clearly have a heart for leaders. While preparing for this interview, I noticed and signed up for the ATD Metro-DC Chapter’s April session for the Leadership Development Community of Practice (CoP). That’s also done as a partnership with GMU and hosted on their Alexandria campus. Why do you have such a heart for developing leaders? Dolly: We need them. Not just we at C2 but we in the learning profession. Even with C2, we’re doing all we can to develop our members to be leaders. We provide all staff compensation for professional membership and conference attendance, tuition reimbursement, and a host of other activities and plans to ensure our workforce is engaged. We have our own internal Communities of Practice, as well. EJ: I don’t see an official “CLO” listed on the company website. Can you tell me who serves in that role at C2? Dolly: I am the Chief Learning Officer at C2. EJ: Okay. That means you’re the ideal Executive Chief Learning Officer – someone who is the CEO of a learning and performance improvement business. Dolly: I don’t know if I’m the ideal anything, but the CLO is a person, not just a job. The CLO is a visionary, is always thinking forward, is the driver of innovation and learning, the driver of strategy. The CLO is always focused on improving performance and filling identified gaps. EJ: How do you stay abreast of what’s happening, both in the company and in the learning and performance improvement communities? Dolly: I read a lot. As far as the company, we have our Communities of Practice that I follow, our Demos of the Month, where our team members can share what they’re working on, our innovation lab, which holds sessions regularly, and we are ideating all the time. I do a lot of listening. At this point we were nearly an hour and a half into a 30 minute interview. Throughout the interview, Dolly asked questions about me. Dolly: Tell me about yourself. EJ: I’m a freelance instructional designer and developer, really. Just started my business last year. Worked far less than I was and still gave myself a raise. Dolly: How did you get started? Dolly: Let me stop you right there. You’re talking about this as a negative experience. You’re telling me you had the opportunity to do and learn these things. These are positive experiences and you need to start thinking of them that way. In fact, I knew that Harkcon was a great place to work – especially when it comes to Harkcon being loyal to its people. I knew it was actually me that allowed myself to get into these difficult situations – trying to be “Helpy Helperton” (as my mentor would say) – and become burned out as a result. I needed to leave when I did, but I am incredibly grateful for all the experiences I had at Harkcon and how loyal and supportive Harkcon has been to me. Harkcon was supportive even in how they directed Cellebrite, one of Harkcon’s clients, to be one of my early clients. Dolly: Let me see. Harkcon. I know of this company. Tell me, is Rich Arnold still there? EJ: It’s funny you should mention him. He’s my mentor. He’s no longer with the company officially, but he still does some projects with them from time to time. He now works as a consultant. Dolly: He’s a good man. Around the middle of the interview, when we talked about how C2 began. Dolly: So, what are your plans for your business? Where do you see the business in the future? EJ: Eventually I want to lead teams of people. The whole reason I went into the ECLO program was to learn how to start a learning business – like you or Michael Allen or Jeffrey Katzman. I have all these ideas, but I’ve learned – through burnout and failures – just how limited I am in what I can do. So I want to lead teams of people to create world-class learning experiences and performance-enhancing systems. I picked one at random and spoke with her about it. She asked me several questions about it. Dolly: EJ, this is not a business. And I don’t want to be mean here, but, at this point, you are not an entrepreneur. And make no mistake, an entrepreneur is willing to work a hundred hours a week. Again, it’s not a job, it’s a passion. EJ: So, what advice do you have for me at this juncture? Dolly: What do you mean? What do you think you need to do? EJ: Well, going back to what you were telling me at the start of the interview about yourself, I need to start writing and participating in conferences. Dolly: What about your business? What do you think you need to do immediately? EJ: I’m not sure, to be honest. Dolly: You need to make a business plan. EJ: Yes. Yes I do. Dolly: Look, EJ, I don’t mean to be rude or insensitive here, but I’m serious. EJ: No, I get it. This is good, and I need to hear it. I can build something off of truth. Dolly: Good. You need to get your arms around your ideas and business pursuits. Without a plan, you can’t do that. Look, I can’t fit my arms around this table, it’s too big. I can get my arms around this (she circles her arms with clasped hands), I can get my arms around a business plan. That gives me the steps I need to bring my ideas into reality. And, EJ, I hate to say this, but you look like you get dejected easily. You can’t be a CLO or ECLO or CEO and get by with that. As a CEO you will get bloodied every day and you will need to come away smiling. We talked some more about some of my other ideas, with me admitting that I still need to build a business plan and proposals for them. Dolly: And now you’re starting to sound like an entrepreneur. This makes me happy. Now go get to work. Dolly and I, concluding the interview. If you read this far, you’ll understand why I think C2 is in good hands with Dolly’s leadership and example. I know she gave me a Shark Tank kind of interview, and I am grateful for it. Obviously I needed to hear it. Many thanks to Dolly and Dana, and Lauren, C2’s extremely hospitable receptionist, who gave so much of their time and energy on a busy Monday. I am also grateful to be part of the ECLO program at George Mason University, and I thank C2 Technologies for supporting this program.